Holyfield and Tyson. Ali and Frazier. Hopefully Pacquiao and Mayweather if the two stop dancing around the issue. 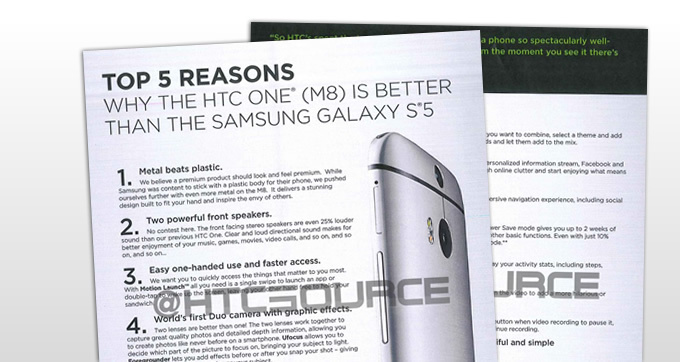 And now, HTC M8 vs the Samsung Galaxy S5. These two heavyweights of the smartphone world have launched pretty much at the exact same time. It’s practically the first time we’ve seen an actual head-to-head launch of two major flagships. With this unique situation comes the need for each company to exalt their smartphone as the second coming, going as far as calling out the competition in a direct fashion the likes of which we don’t often see. HTC has seemingly thrown the first known punch, with leaked documents from the company attempting to sway salespersons on why the One M8 is better than the Samsung Galaxy S5. Metal beats Plastic: subjective, no doubt. There’s no secret that metal gives the One M8 that more premium feel, though questions of durability and signal strength even out this particular area. Two powerful front speakers: can’t argue here. Nothing beats BoomSound (even on last year’s model). Easy one-handed use and faster access: they’re talking about the Motion Launch features, mainly. Samsung doesn’t have it. 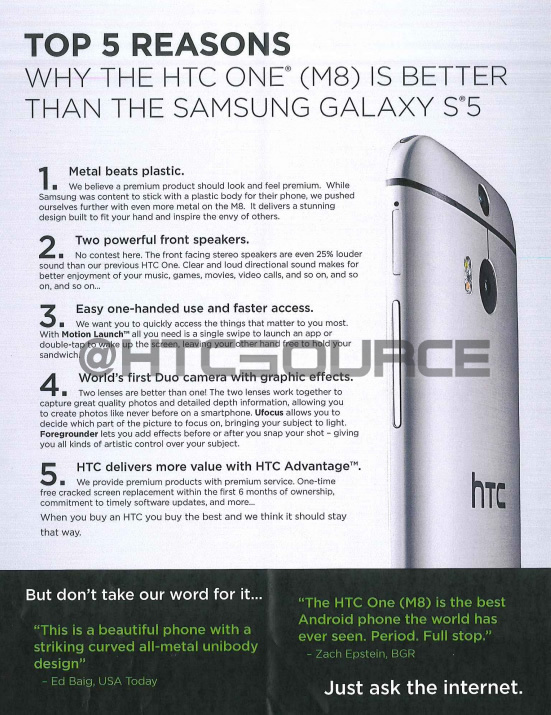 HTC does. Simple as that. World’s first Duo Camera with graphic effects: fun and cool, though the camera sensor itself is seen as inferior to the ISOCELL sensor on the Galaxy S5 (though UltraPixel can still hold its own). HTC delivers more value with HTC Advantage: free display repair, 50GB of Google Drive space, and a commitment to timely software upgrades. Samsung can likely match two out of three of those advantages (with the display repairs being left up to whether or not you decided to grab insurance for your device). While we haven’t had enough time with either device to say HTC is right or wrong on these, they do make compelling arguments. 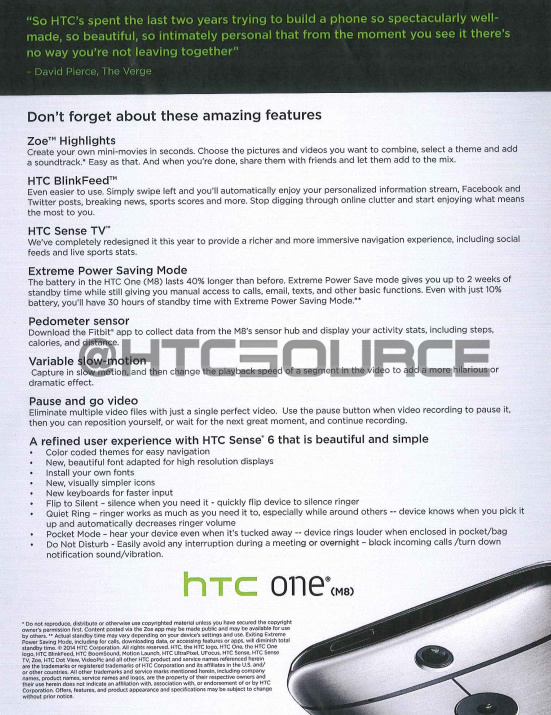 Of course, HTC can’t force anyone but their own employees to push the HTC One M8 over the Galaxy S5, so whether or not this document will help move more units will depend on factors such as personal opinion, sales incentives and more. It’ll be an interesting race to say the least. Be sure to read the full sales document below.